Finished-Bore Sprockets are provided with standard keyway and 2 set screws. 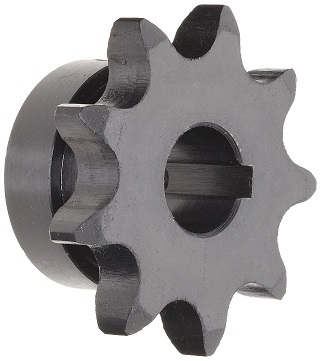 The keyway is for fixing your sprocket to the shaft to keep the sprocket from spinning. One set screw is located over the key and one is located 90 degrees to the key for locking onto the shaft. They have two set screws and a standard ANSI keyway, except 1/4", 3/8", and 1/2" bore sizes do not have a keyway. The keyway is American National Standard Institute (ANSI) standard, please be sure to double check your keyway before you order. Don’t forget to order keystock if you need.